Located in Cincinnati, Ohio, the Krohn Conservatory is a part of the Cincinnati Parks preservation and educational efforts. Visitors will find more than 3,500 plant species and many special exhibitions and programs hosted year-round inside the architecturally significant conservatory. The conservatory is in one of the many parks which is managed by the City of Cincinnati – Eden Park. The city of Cincinnati aims to conserve and sustain natural parks and cultural areas for public enjoyment and enrichment, and the Krohn Conservatory is one of them. The Krohn Conservatory was founded in the early 1930’s but is definitely not one of the first greenhouses built in the Eden Park area. The first greenhouse was built in Eden Park around 1880, but back then they were strictly meant to grow useful plants – not to entertain or educate. In fact, the first greenhouse opened that was meant for public display wasn’t until the year 1902. Currently, the Krohn Observatory aims to offer a large and ever-changing variety of plant species from all over the world. Every member of the family will find something exiting and entertaining – even children! These plants are meant to not only educate but delight visitors with plant species they may have never seen before. Because their display changes so frequently, visitors from far and wide are drawn to the conservatory – approximately 150,000 people a year! As mentioned, the plants on display changes quite frequently, however, there are often returning favorites that are staples in the collection. Permanently on display is the rainforest waterfall which is surrounded by exotic, blooming, colorful plants. The Palm, Desert, Tropical, and Orchid houses are permanently on display as well – though the specific plant species within may change. And quite possibly the most delightful aspect of the conservatory are the butterflies! Hundreds of butterflies from a large variety of species roam the conservatory and keep visitors company as they explore. Currently featured in the conservatory are the colorful and sweet-smelling summer blooms, including hydrangeas, Carolina allspices, and calibrachoas. Petals & Pedals: This event encourages adults and children alike to get outside, get active, get their helmet out, and ride their bikes to Eden Park for a flower extravaganza! If visitors show off their effort to be green and park their bikes right outside the conservatory – they will receive one dollar off admission! The conservatory is currently exploding with gorgeous summer blooms filling the air with sweet smells and beautiful butterflies. There is no better way to spend the steaming hot afternoon! City planner, Mel McVay will also be in attendance to discuss the biking infrastructure plans for the city of Cincinnati. This event will be held from July 1 until August 27, 2017. Daylily Show: This event is sponsored by the Daylily Society and features a large variety of daylily in fun and beautiful arrangements and plantings. The event will be held on July 1 from 10-3 p.m.
Krohn Zone Celebrates Herbs: This event features edible herbs that can be planted and cooked with in everyone’s garden at home! The event will be held on July 8 and 9 from 10-4 p.m. Local Chef Ursula will even host an instructive cooking demonstration for attendees on July 8 from 1-3 p.m. where she utilizes the herbs grown at the conservatory. Spun Bicycle: Local bicycle shop owner, Dakota Stone, will be at the conservatory on July 22 from 12-3 p.m. to help fix visitor’s bicycles and sell some cool t-shirts and other bicycle swag. Fashion Night: This event is hosted Cincinnati-wide and is presented by Cincy Chic. It will be on July 28 from 6-9 p.m.
Return to Eden: This event is also known as “The Monarch Festival” and is a fun-filled day inn Eden Park for the entire family. 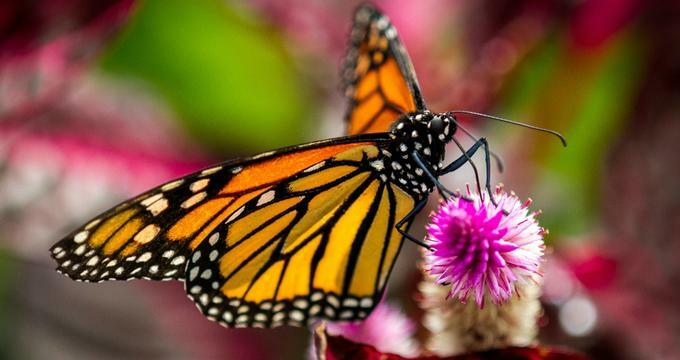 Visitors can enjoy live music, food trucks, and a craft market while they witness and enjoy the migratory passing of the Monarch butterflies as they head to Mexico. This event will be held on August 27 from 10-4 p.m. There are a variety of educational programs hosted at the conservatory, the most popular being summer camps! There are also private and group tours, butterfly shows, and educational talks by local botanists and conservatory curators. The butterfly shows are held annually in the spring (March – June) and features many exciting and interactive exhibitions.